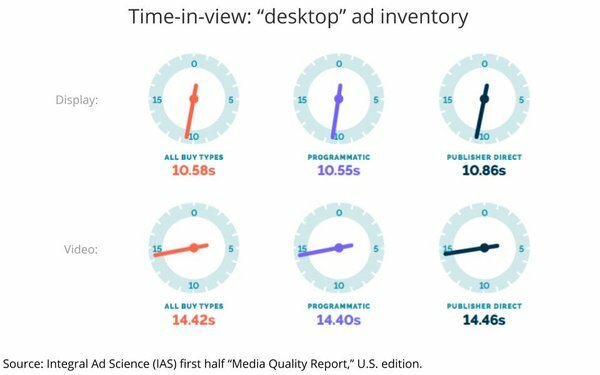 As the ad world moves increasingly toward time-based ways of valuing ad engagement, Integral Ad Science has added a new “time-in-view” component to its periodic “Media Quality Report” benchmarking the quality of digital ad inventory. 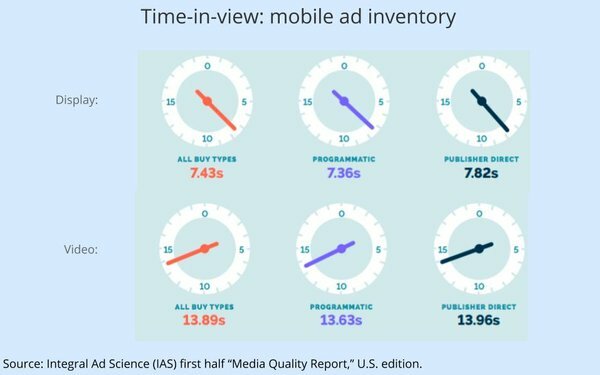 The report sets a baseline for the duration of time that average digital ad inventory is “in-view” -- meaning a user has an opportunity to actually see it -- for both desktop and mobile, as well as breakdowns for inventory sold direct by publishers or programmatically. The data, which represents IAS’s assessment for the first half of 2018, not surprisingly shows that desktop environments generally average longer in-view exposures than mobile ones, and only slight variations between programmatic and directly sold inventory. Interestingly, video ad inventory was in-view much longer than static display ads -- especially for mobile, which was nearly twice as much time in view as display. The industry’s minimum standard for qualifying as an ad impression -- as per the Media Rating Council -- currently is one second for display and two seconds for video.